Carson Wentz and the Eagles flattened Dallas in their only meaningful game last season. The Birds are favored by 6.5 points ahead of this Sunday night’s game at Lincoln Financial Field. It's the first Eagles-Cowboys game since sports betting was legalized outside of Las Vegas. The Eagles are favored by 6.5 points, according to Philly.com oddsmaker Vegas Vic. The Eagles, of course, are coming off a bye at 4-4. Dallas is 3-5 and, after Monday's listless loss to the Titans, leaking enough oil to require a derrick. 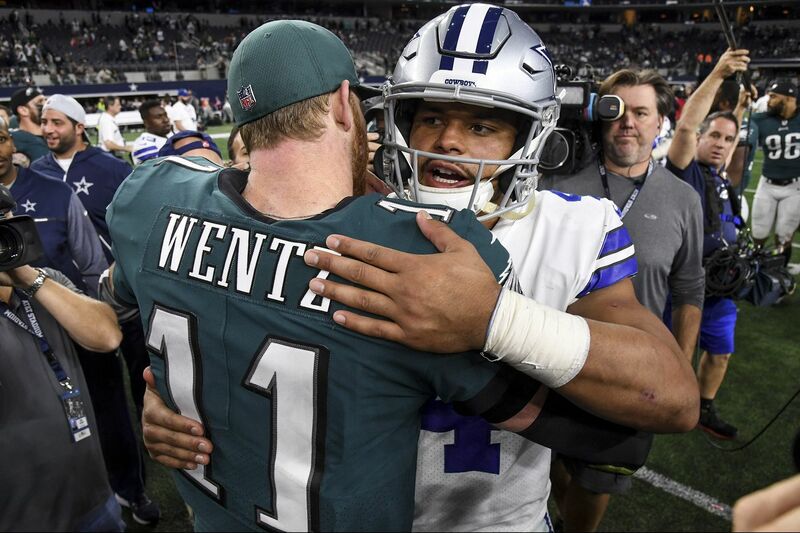 Philadelphia rolled the Cowboys, 37-9, in Dallas last season behind two touchdown passes by Carson Wentz and 215 rushing yards by the offense. The rematch was a meaningless meeting in Week 17 won by Dallas, 6-0. Most of the Eagles regulars did not play, but Dak Prescott and Ezekiel Elliott played full games. Point spreads for this week's NFL slate and some notable college football games are below. Jason Garrett is obviously free to do what he pleases with his personal time. But opting to hang out at the World Series in LA during the bye week as HC of an underwhelming 3-4 team, only to get hammered at home on MNF by a lousy Titans squad, makes for horrible optics. Double V is gonna look ahead to some key games on Turkey weekend. And there are some projected spreads that will make your brain melt. In the SEC, Alabama will be favored by approximately 25 points over Auburn in the annual throw down at the Iron Bowl on Nov. 24. Gotta check my memory card, but don't believe I've seen a number that high in this game in the last 40 years. If Notre Dame gets by Florida State and Syracuse, the only speed bump left in the quest for a regular season perfecto is USC. And right now, the Fighting Irish are projected out as an 8/9 point favorite over the Trojans IN Los Angeles. And when it comes to dotting the i, barring any injuries, Michigan will come into Columbus as a projected 2/3 point favorite over the Buckeyes. "Money" is looking for more money. Floyd (Money) Mayweather Jr. (50-0-0, 27 KOs) is looking for another ginormous payday, and has signed on for a bout against MMA star, Tenshin Nasukawa from Japan. Don't know his nickname yet, but I'm gonna call him "Ten." Ten is opening up as a favorite at around -$140, with Mayweather an underdog in the neighborhood of +$120. That would be the number if they used MMA rules. If it was strictly boxing, the number would turn around, and Money would be a heavy favorite. Ten is only 20 years old and rumored to have a very heavy punch. Might have to throw down if they actually go into the Octagon.